Q: Marcus, if we could start with you. It's been a busy couple of weeks for you since Mexico. You've announced your plans for 2019, in IndyCar. Is that farewell to Formula 1 or do you see IndyCar as a stepping stone back to Formula 1? Marcus ERICSSON: I don't really know the answer to that question; I think that's what the future will tell. I go to America fully committed to doing a great job over there. I see myself as being there for quite some time. But then in the future you never know what will happen. I'm just super excited to go there. I met the team and it felt really, really good. I think IndyCar, from the outside, looks like a lot of fun, so I can't wait to get started. Ericsson: It's been amazing, I've really enjoyed it, but it's also been tough. Most of the time I've been running in back-of-the-grid teams and cars and that's always tough, especially when you're used to growing up through the junior ranks and you always fight for wins and podiums and you always go in with that mindset to a race weekend, and then the last five years that's never been realistic and that's been the tough part of it. That's why also I'm so excited about next year, that I can actually be back racing for wins again. I bring a lot of experience and a lot of good memories from these five years, for sure. Q: Let's just finish by talking about the on-track performance of you and your Sauber. You had your sixth points finish of the year in Mexico. How confident are you of repeating that here at Interlagos? Ericsson: We are confident that we can be competitive here. I've scored points now two weekends in a row and I'm aiming to continue that. I think the car at the moment is competitive. We know it's very tight there in the midfield but we've done a good job all year to improve all the time and we continue to do that and I'm sure we're going to be in the fight this weekend as well. I feel really good, feel really confident so I'm sure we're going to be there and fight for those points on Sunday. Stoffel VANDOORNE: It's a bit hard to tell. I'm starting a new challenge, which I'm really looking forward to, with HWA in Formula E. I don't really have a break this winter, so I'm going straight into that and that will also be… my mindset is to do the best job there. So whatever happens in the future, it's difficult to tell at the moment. You know, the driver market this summer has been a little bit crazy and no one could have really expected what has happened. Things like that can happen in the future and who knows what is going to happen. But for now I'm just focusing on Formula E and trying to do the best job there. Vandoorne: Definitely it's not been the best two seasons. I've had a great time with McLaren through the junior series and they've supported me a lot to make the step into Formula 1. But the two years I've had in Formula 1 have been good in terms of experience but I would have much preferred to fight higher up. The timing was right to get to Formula 1 and I think I was with the right team, the right support, but I think just the competitive we've had over those two years have not been great. It would have been nice to fight a bit higher up. Vandoorne: Nothing changed. That weekend we just looked a little bit more competitive in general. From my side that weekend went really well from the start. Qualifying wasn't maybe the best for us but we were a little bit closer to the group in front, which usually means on race day we are a little bit better than them. It turned out to be that way. I think the tyre degradation helped us quite a lot there to be a bit more competitive and to make a bit of a difference. It was nice to finish eighth and get some points on the board and also quite important for us for the Constructors' Championship. Q: Thank you. Brendon, we've been speaking to these guys about 2019. Any update on your plans for next year? Brendon HARTLEY: Pretty much the same stance I've had for the last races. It's probably not worth going into. I'm still very much focused on my own performance, what I can do to get the most out of the weekend, working with the team. I'm focusing on myself and not much has changed, so there's no real news to give you. Q: You've started ahead of your team-mate Pierre Gasly in two of the last three races, so it feels like you're getting a bit of momentum behind you. While we're in reflective mood, can you just talk us through how you feel you've improved as a driver during 2018. Hartley: Yeah, I definitely have improved and there was a lot to learn, being a rookie – an old rookie at 28 years old – but still a rookie in Formula One. Coming from LMP1 there was a lot of similarities, which I've touched on many times before but then also a lot of new things to learn. Tyres is a big one that springs to mind. Maybe the environment in Formula One, the style of racing, and I guess some of the external pressures that are sometimes put on you as a driver. I felt through the season… yeah, I've maybe hardened my approach, I've got stronger, I've learnt from mistakes, figured out, with the engineers what's going to get the most out of the weekend for me, in terms of the car, the set-up. I think I've bought a lot of experience to the team and in the second half of the season I've definitely been stronger. Qualifying, me and Pierre have been quite aligned: sometimes he's been just ahead, sometimes I've been just ahead. The races haven't always worked out and I don't think the points on the board is a true reflection. I think sometimes people do forget it's also a team sport, it's not just an individual, it is very much a team sport and I've been a team player. I think now the focus is really on making sure we're ahead of Sauber before the end of the season. That's the main focus for Toro Rosso right now and I think we've got an exciting couple of races ahead. Mexico we had really, really good pace considering we had the older-spec engine. Even with the issue I had on the first lap with the flat spot, I was still in a points position before the penalty and the damage, and I think that, knowing how much performance we can gain from the new engine, and potentially the new aero package that we'll both have this weekend, I think we can be excited and optimistic for the last couple of races for 2018. Hartley: It's a tricky one to answer because these Formula One cars are very light and you have close to 1,000hp – I don't know the exact number – and the objective from the drivetrain, which is massively complicated with three different engines and all sorts of calculations going on to make it all work but in theory you get power when you put down the throttle pedal and… I guess the point I'm trying to make is that every track we go to, we have different downforce levels, different altitude in Mexico, for example, so to feel a power increase is tricky for a driver but the lap time shows a story and there's no question from everybody in the team and from all the data that there's a really big step. I think we suffered a little bit in Mexico, especially in the racing environments and off the start line not having it – but we have it onboard again for the next two races and yeah, it gives us something to be optimistic about. Q: Lance, we've spoken to everyone else about 2019, so I feel it's only right that I should ask you the same question. When are you going to tell us what your plans are? Lance STROLL: Yeah, well, right now I'm still focussed on the remainder of this season. There's two races left, that's where my heads at. We'll see what the future holds. Q: Can we expect an announcement about your future within this season or do you think it'll be a winter announcement? Stroll: I believe so. Time will tell. That's all I can say right now. Q: I think that's you telling us to move on. We're in reflective mood here. You're coming towards the end of your second season in Formula One. Talk us through your ambitions in the sport now. You've been able to observe all the other drivers around you, including the world champions. What do you think you can achieve in Formula One? Stroll: That's dependent on a lot of things. I mean, right now I'm just taking it day by day, year by year. We'll see – but there are so many factors in Formula One that are important. You need to be in a good car first of all – this year has been a good example: it's been a very challenging year with the car. The performance really hasn't been there and therefore we couldn't score many points. So that's a bit part of it – but yeah, I'm not looking too far down the line right now, I'm really just trying to, y'know, focus on the present, make the most of where I am currently and we'll see down the line what happens. It's too hard to tell, sitting here today. Q: How difficult has it been for you to make the most of where you are currently, because it's been a difficult season? What do you feel you've learned during 2018? Stroll: Yeah, it has been very challenging. The car just hasn't been there so we've just been surviving every weekend rather than actually competing. Been getting knocked out in Q1 a lot, most of the races I've had good starts and I've been in a points-scoring position, we've just fell back down the order so it's kind of always been the case, we've just been on the back foot throughout the whole year. We haven't really developed the car at all since Australia, I don't think we've really improved the car at all. It's been tough to see some of our competitors early on, like Sauber, for example, who were neck and neck with us at the beginning, make big steps in the right direction, compared to us. Yeah, it's been a survival year, that's all I can say. But I've still developed as a driver, I've matured as a driver. The second year in Formula One, more seat time, more experience. I've absorbed a lot of information, even though it's been a very challenging year compared to last year but that's the nature of the sport. As a driver, you have to accept that some years are more challenging than others and that's part of the game. Q: Kevin, we're talking about 2018, so how do you reflect on the season that's just been? It's been a good year for you. You can clinch your qualifying head-to-head against Romain Grosjean this weekend in Brazil. 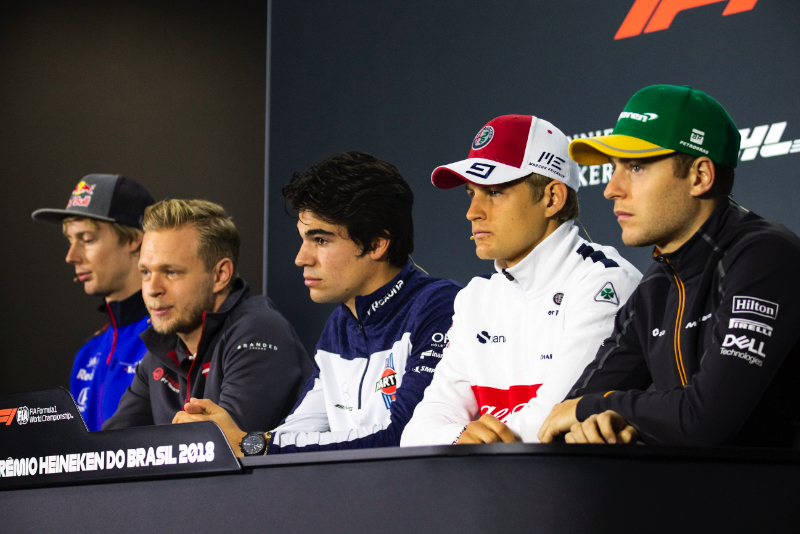 Kevin MAGNUSSEN: Yeah, it has been a pretty good year, I think. It has shown that we are making progress with the team, year by year, and I think our aim should be to keep that up in the next season. I think this year it looks like we're probably going to finish fifth in the Constructors unless we get some very good weekends in the next two weekends. That leaves us at least one realistic target for next year, to take another step forward. I think this year we've had a very fast car. We haven't always scored the points that we should have for different reasons but the good thing about that is that we can go into next season and know that we can do better, because the performance is there. Q: Well, Mexico really hurt the team's chances of getting P4 in the championship, didn't it? Both cars knocked out in Q1 for the first time this year; do you understand what the problems were in Mexico? Magnussen: Not quite, but I think we understand that it's probably to do with tyres as we hadn't changed the car so the only thing that really can be such a big factor is the tyres and I think in Mexico you have these factors like you have very little downforce because of the altitude and that has a lot of knock-on effects on different things so cooling as well and you run the car in a different window in Mexico. I think we got the tyre performance a little bit wrong so we suffered a lot in Mexico and that was a weekend to forget, definitely, but also at the same time we of course are trying to learn from it because last year and the year before the team also had a bad weekend in Mexico, so hopefully next year we can learn a bit more and get there a little bit more prepared, to not have such a big off weekend. Q: (Ian Parkes – New York Times) Stoffel and Kevin; Stoff you touched on your two years at McLaren, can you just expand a little on your relationship with Fernando, what you might take forward from those two years, having worked alongside an experienced double World Champion? And Kevin, could you just give me your thoughts on Fernando as a driver? I know you've expressed some disagreements in the past. Does that still hold true and what positives can you say about him? Vandoorne: Yeah, for me it's definitely been a good experience to go alongside Fernando, let's say. The way he prepares a weekend – obviously Fernando's one of the most experienced drivers on the grid. I think as a rookie it was very valuable for me to learn from that, especially the way he prepares his weekend, through the practice sessions, how he's building up to the race on Sunday, how he's trying to extract the most so there's a definitely a lot I've learned over the past two years which I can carry forward. Magnussen: My respect for Fernando as a driver is very big. There's no doubt he's definitely one of the best drivers on the grid. Even though we've had some tough fights and a few arguments, there's no damage to my respect for him as a driver. I think that's it.